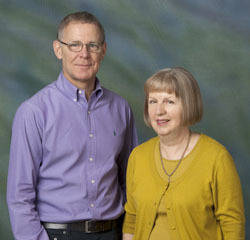 We were married in 1982 and have always had a passion for alternative health and healing. We believe health is wealth. Our hobbies include gardening, bush-walking, reading and golf. We currently have a beautiful garden with roses, ornamentals and natives. We would like, in the future, with a little more space to have a comprehensive fruit and vegetable garden using home-made compost. Over the years we have practiced meditation, breathing techniques, yoga, pilates and anything we could find to enhance our state of well- being. We give each other regular Quantum Biofeedback sessions to keep ourselves energetically tuned up. We find enormous benefits from this. It really helps us to deal with the challenges that our ever-expanding life constantly presents to us. We have a spiritual guru from India called "Amma". We always enjoy attending spiritual retreats when Amma comes to Australia every two years. She has an ashram in Carrum Downs, Melbourne, which we occasionally attend. We love attending "Abraham-Hicks Workshops" when Jerry and Esther Hicks come to Australia- they are life-changing. Our other mentors include Joe Vitale, Brad Yates and Rhonda Byrne. We all need help from others along our journey. We purchased our EPFX SCIO in 2007 and did our level 1 training that year in Melbourne. After this, Elizabeth completed her level 2 and 3 advanced training in Coolangatta, Queensland in early 2008. In 2009 she did her level 2 and 3 refresher course in Sunbury, Victoria. Late in 2008 a Quantum Biofeedback Therapy Diploma course became available in Australia through the Asia Pacific College of Natural Medicine (APCNM). Elizabeth completed her full diploma in 2009. She is a fully qualified practitioner in Biofeedback Therapy. The Quantum Biofeedback Therapist course with APCNM is the only Biofeedback Therapist course accredited throughout Australia, New Zealand and Asia, as approved by the TGA. Elizabeth is also a member of the International Institute of Complementary Therapists and, as such has full professional insurance cover. She has also completed separate certificates in Physiology, Anatomy and Mineral Therapy with the APCNM. In addition, Elizabeth has done several on-line training courses (webinars) from America. These courses specialise in different areas of Quantum Biofeedback. Because of her passion in the field of biofeedback, she is constantly striving to broaden her knowledge and hone her skills. She keeps abreast of the latest developments in this field. We have the very latest SCIO operating program. The software is constantly being updated and improved. We want our clients to receive maximum benefits from their Quantum Biofeedback session. Donald is currently more involved in the administration and website development side of the business. He is striving to build a world-class website that educates people about the marvellous new world of Quantum Biofeedback in Australia. Quantum Biofeedback has been around for quite a few years in America. After 10 years approximately in Australia it is growing in popularity. We believe Energetic Medicine is the way of the future. Currently there are 15,000 EPFX/SCIO Biofeedback machines in use globally. They have four universities in North America set up specifically to offer advanced training applications on the the EPFX SCIO. These are Vital Connection, Imune, IQUIM and the Quantum Academies. It is a rapidly growing world-wide phenomenon. Our goal is to offer assistance to people who choose to allow themselves to live life in their natural state of wellness. We both intend to live long, healthy, active, happy lives. We have experimented and tried many different modalities. We are interested in any method that gets results so we can pass on the benefits to others. Quantum Biofeedback is a subtle but powerful way of reprogramming your "body electric" to facilitate self-healing on all levels of your being.